(Overheard) Democrat Mike Frerichs Dreams of the "Ellen Endorsement"
It takes a very self-absorbed politician to think that a 'special announcement' in his/her hometown could be about themselves. But...based on us having a mole inside the Frerichs campaign staff, turns out: That might be the case (not) for Democrat for Illinois Treasurer Mike Frerichs. MF: (Breathlessly runs into the campaign office) Hey you guys! Did you hear the news?!?! Campaign Staff: What news, Mike? Did Home Depot start to carry your officially 'endorsed' #TallTales line of Step Ladders that you can start to take to events? With one of those, our photos that we post on Facebook aren't so awkard... what...with you towering over everyone?? Or...this will eliminate the even more awkward shots when we have to pose you faux sitting with people?" MF: No they're still not returning my calls. Not yet at least. A guy can dream, though, right? Maybe I can have some of my union 'buddies' picket out front of Home Depot to change that? But...this is something even better! 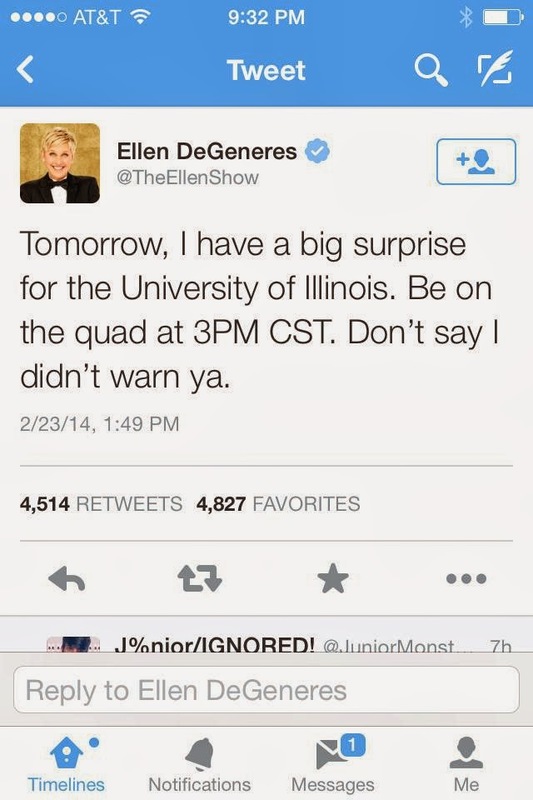 Ellen is coming to town! CS: Great news! But...why does that matter to us? MF: Well...A-doy, guys!?! She's obvs coming to endorse our campaign, right? MF: Yeah. Of course, dudes. I mean...after all, she *has to have* noticed me flailing about on Facebook by now. What's more endearing to the voting public - and Ellen DeGeneres' audience - than pictures of me sitting down with some folks over pizza in Berwyn?!? That's gold, Jerry. Gold. CS: You're right. That TOTALLY has to be why she's coming to town. We have a great idea! We should make a video! Even if Ellen isn't coming to town to endorse you, that's just fine. We have a lot of experience making videos with lies. We'll just say that's why she's here and cross our fingers that Rich Miller - or those guys at the Truth Team - don't catch us. MF: Sounds like a plan. I'll catch up with you later. I have to go lie on the inverse-inversion table. I'm trying to shrink a few inches to help with those Facebook photos. MF: Yeah...it's the opposite of an inversion table. Got a busy day. After an hour there, I have to run to the latex office to pick up the new flyers. Then...off to check the Facebook stats. Talk to you guys later. Send me the video updates when you have them. Come on in here for a break.